The arcane master, Umptray the Wizard, is protecting a number of thieves, cut-throats and lunatics, and it’s possible he does not even realize it! Hidden away in his tower he wreaks havoc with little notion as to the destruction being caused. It must be true! It was reported by the Fake Gnus! 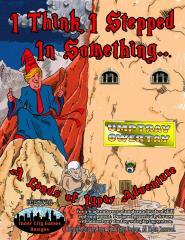 Can you survive the intricate traps, powerful guardians, and downright silliness of Umptray Owertay? There's only one way to find out!